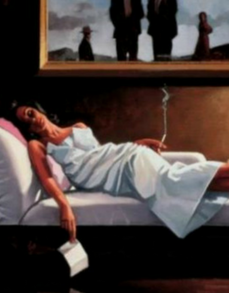 Dancer For Money by Jack Vettriano, has been released in 2018 as a premium Limited Edition Print, in celebration of Vettriano's greatest works. This is a high quality giclee print which is hand embellished with 3 coats of lacquer to give the print a satin finish. It is board mounted and is in the same frame that the original Dancer for Money. 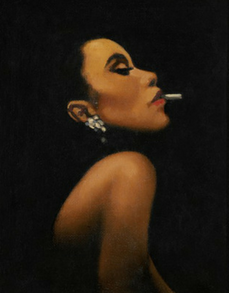 This Limited Edition is supplied without glass and with no white border (where Vettriano normally signs and numbers his prints). 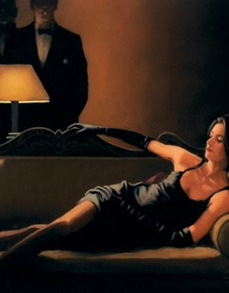 Instead the Limited Edition is signed and numbered by Vettriano in the bottom corner for the image in silver pen. Only 50 Dancer for Money Premium Limited Edition Prints have been released, along with 5 Artist's Proofs. Dancer for Money has been released previously as a silkscreen Limited Edition Print. In 2000 an edition of 275 was released and measured 69 x 57 cms. It was sold out quickly and currently secondary market prices are around £3500. The original oil on canvas of Dancer for Money was purchased by the actor Jack Nicholson and was displayed at the Half Way To Paradise Exhibition in Hong Kong at the Museum Annex in 1996. This Limited Edition Print is only available framed and comes with Certificate of Authenticity.